A 19-YEAR-OLD MAN has been arrested by police in England after reports that a photo of a burning poppy was posted on Facebook. Police in Kent said they received a complaint yesterday afternoon about the photograph, which was reportedly accompanied by an offensive comment. The man is due to be questioned today on suspicion of “malicious telecommunications”. Kent Police defended the decision to arrest the man, saying that there was a duty to investigate whenever a complaint is received. 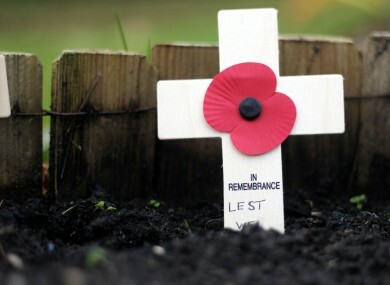 The teenager was arrested on Remembrance Sunday, which commemorates the armistice which ended World War I on 11 November 1918. Poppies are worn as a mark of respect and a symbol of remembrance for Commonwealth soldiers who died in war. The man was arrested under the Malicious Communications Act 1988 which states that it is an offence to send an electronic communication or letter to another person which conveys a message which is indecent or grossly offensive, a threat, or information which is false and known or believed to be false by the sender. The Act states that a person is guilty of an offence if the purpose in sending the communication was to cause distress or anxiety to the recipient or to any other person who it is intended should see the message. A statement from police said: “A man is due to be interviewed by police this morning following reports that a picture of a burning poppy had been posted on a social media website”. “Officers were contacted at around 4pm yesterday, Sunday 11 November 2012 and alerted to the picture, which was reportedly accompanied by an offensive comment”. “Following an investigation by Kent Police a 19-year-old Canterbury man was arrested on suspicion of an offence under the malicious communications act. He is currently in custody”. Anyone found guilty of an offence under the Malicious Communications Act faces a prison sentence of up to six months or a fine. Email “Man arrested for posting photo of burning poppy on Facebook”. Feedback on “Man arrested for posting photo of burning poppy on Facebook”.